My dear friends Michele and Moe got married last summer and hosted a wonderful wedding celebration in their newly renovated back yard. Michele wanted orange and red flowers arranged in her vintage mason jar collection. We used poppies, ranunculous, dahlias, anemones, and freesia to achieve the compact and impactful look Michele wanted. 11 Jun	This entry was published on June 11, 2011 at 5:00 pm. 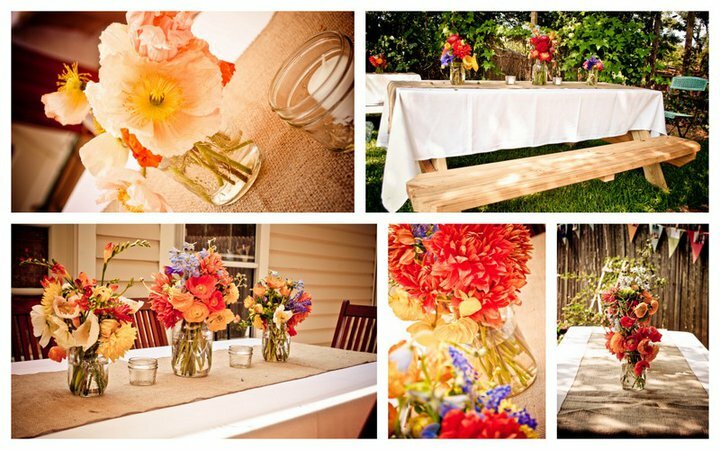 It’s filed under Centerpieces, Romantic, Weddings and tagged backyard, dahlia, flower, mason jar, orange, ranunculous, red, wedding. Bookmark the permalink. Follow any comments here with the RSS feed for this post.